The amazing Opal Matrix! 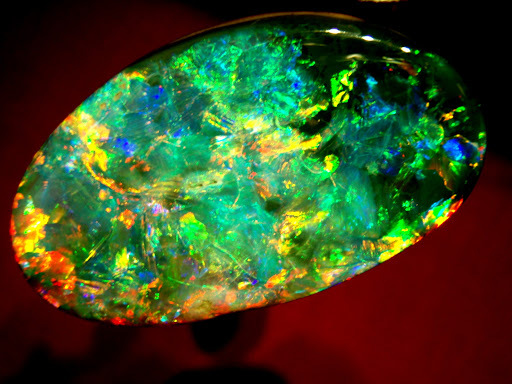 The largest opal in the world, so far. Found in Australia, it is 55,000 carats in size! Found by Stuart Hughes and his team, it is valued over $1 million dollars and it outweighs the previous record holder by an unbelievable 48,900 carats. 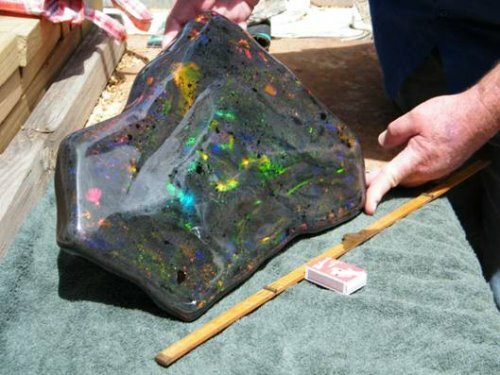 The Galaxy Opal is the world’s largest polished opal, certified by the Guinness Book of World Records in 1992. It was found in Brazil in 1976. It weighs approximately 3,749 carats! It was carved from a grapefruit-sized piece of rough stone weighing 5,205 carats by Scott Cooley. 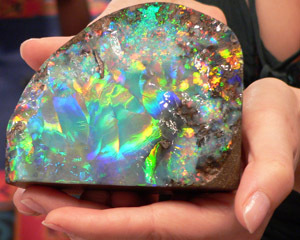 The Olympic Australis Opal (photo below) was found in 1956 at the “Eight Mile” opal field in Coober Pedy, South Australia. It was found at a depth of 30 feet and so named because the Olympic Games were being held in Melbourne at the time. The Olympic Australis consists of 99% gem opal, with the remainder of 1% being the soil still attached to the stone. It weighs 17,000 carats as was valued at $2,500,000 in 2005. These opals are pretty amazing! This entry was posted in Jewelry, Jewelry History, Jewelry News, Jewelry Trivia & Facts and tagged galaxy opal, jewelry warehouse, october birthstone, opal jewelry, opal matrix, opals, the largest opals in the world. Bookmark the permalink. Hi I’m curious as to the large opal matrix you show on your web site! How did you come about this I know we’re it exactly come from in Andamooka Australia as I found it with my father and have the original photos of it. We sold it to a bloke from coober peedy lost contact with him and have been trying to for a while now.